'Joviality' (Keith Keppel, R. 2011) Seedling# 04-69A. TB, 34" (86 cm), Midseason bloom. Standards pure white (M&P 9-A-1), central base pinard yellow (9-J-2); style arms white, yellow highlights; falls empire yellow (9-K-3) to dandelion (9-L-4) paling toward white central area, fine pale-yellow to white rim; beards dandelion to golden glow (9-L-7), cream base. (seedling# 00-254B: 'Smiling Faces' x ' Sea Power') X 'Tour De France'. Keppel 2012. Hybridizer's comment: Cheerful variation on the yellow amoena theme. 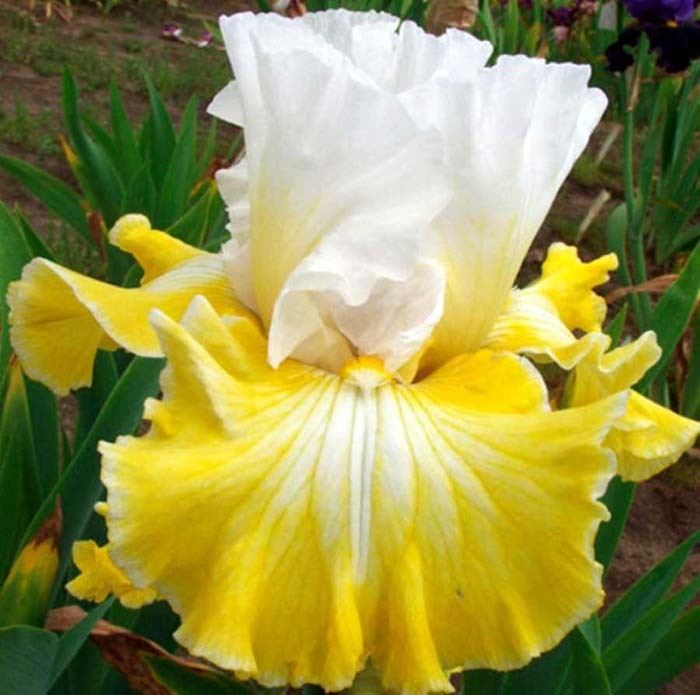 White standards, ruffled and upright to touching, are yellow at the base. Falls, flared and waveruffled, are basically yellow, with a fine lighter (or even white) edge and carry a white center blaze texture-veined and partially washed yellow. Orange yellow beards lighten to cream at end. Good branching, seven (up to ninel) buds. jpg Joviality1.jpg manage 25 K 13 Sep 2018 - 02:17 Main.TLaurin Photo by South Jersey Iris.